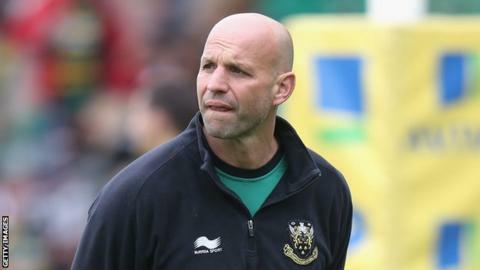 Northampton Saints director of rugby Jim Mallinder says he does not want his side to peak too soon this season. Saints sealed a bonus-point victory at home to Newcastle on Saturday after losing their opening game to Worcester. "We started well against Worcester and seemed to control the game but we sort of went off a little bit," Mallinder told BBC Radio Northampton. "We aren't 100% match fit and didn't play many games in pre-season but we looked stronger in the second half." Mallinder added: "It will take a bit of time and you don't want to be peaking at this time of the season but you do want to be winning, which we didn't do against Worcester. "We took our time to get a bit of shape and the players who came on did well. It was good to see JJ Hanrahan come on in the centre and playing well." Winger George North could return for Northampton at Sale on Sunday after coming back from injury and World Cup duty with Wales. "George has been in a couple of times. He'll be back in training from Tuesday onwards and will be in consideration for next weekend," Mallinder said.